AMC has announced that season two of their historical drama, Turn, will debut with a two-hour episode on Monday, April 13th, at 9pm. The series previously aired on Sunday nights. An AMC Studios production, “TURN: Washington’s Spies” stars Jamie Bell (Flags of Our Fathers, Snowpiercer, the upcoming Fantastic Four) as Abraham Woodhull, a farmer living in British-occupied Long Island during the Revolutionary War, who bands together with a disparate group of childhood friends to form the Culper Ring – America’s first spy ring. Season two of “TURN: Washington’s Spies” moves deeper into the battles waged by soldiers and civilians alike in the pursuit of freedom, and the sacrifices they’re willing to make to secure it. As Abe becomes more committed to the Culper Ring activities, George Washington (Ian Kahn) battles both personal demons and betrayal from within his ranks that threaten not only his leadership but the fate of the revolution. As the colonies struggle to become a nation, the outcome of the revolution will hinge on alliances both on and off the battlefield. The series is executive produced by Craig Silverstein (“Nikita”), who also serves as showrunner, and Barry Josephson (“Bones,” Enchanted) from Josephson Entertainment, and is based on the book Washington’s Spies by Alexander Rose, who served as a consultant for the first season and joins the writing staff for season two. In addition to Bell and Kahn, the series also stars Seth Numrich as Ben Tallmadge, Daniel Henshall as Caleb Brewster, Heather Lind as Anna Strong, Kevin R. McNally as Judge Richard Woodhull, Meegan Warner as Mary Woodhull, Burn Gorman as Major Hewlett, Angus Macfadyen as Robert Rogers, JJ Feild as Major John André and Samuel Roukin as Captain John Simcoe. Joining the cast for season two are Ksenia Solo as Peggy Shippen and Owain Yeoman as Benedict Arnold. “TURN: Washington’s Spies” is distributed internationally by Entertainment One Television (eOne) through an exclusive multi-year output agreement. Viewers can catch up on season one of “TURN: Washington Spies” via AMC On Demand and AMC.com through Tuesday, March 24, and on Netflix beginning Wednesday, March 25. The 3-disc season one DVD’s will be available on Tuesday, March 17 on Blu-ray(TM) + Digital HD and DVD, and include bonus features about the making of the series as well as deleted scenes and featurettes with the cast and producers. Whether commemorating favorite films from every genre and decade, or creating acclaimed original programming, AMC brings to its audience something deeper, something richer, Something More. The network reigns as the only cable network in history ever to win the Emmy(R) Award for Outstanding Drama Series four years in a row with “Mad Men,” and six of the last seven with current back-to-back honoree, “Breaking Bad.” The network boasts the most-watched drama series in basic cable history and the number one show on television among adults 18-49 for the last two years with “The Walking Dead.” AMC’s original drama series include “Mad Men,” “The Walking Dead,” “Better Call Saul,” “Hell on Wheels,” “TURN: Washington’s Spies,” “Halt and Catch Fire,” and the forthcoming “Humans,” “The Making of The Mob: New York,” “Into the Badlands” and “The Night Manager.” AMC also explores authentic worlds and discussion with original shows like “Talking Dead” and “Comic Book Men.” AMC is owned and operated by AMC Networks Inc. and its sister networks include IFC, SundanceTV, BBC America and WE tv. AMC is available across all platforms, including on-air, online, on demand and mobile. AMC: Something More. What do you think? Are you looking forward to watching season two of Turn on AMC? How long should this drama series run? 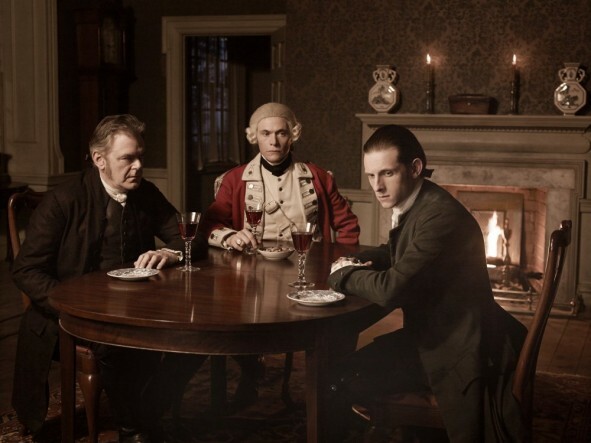 More about: Turn: Washington's Spies, Turn: Washington's Spies: canceled or renewed? Turn: AMC TV Show; To Be Cancelled or Renewed for Season Two? I am so glad this show is returning! This is the kind of show that grabs your attention and reels you in. Really looking forward to the second season … TURN had my rapt attention from the first few minutes! This is a fantastic show. Hope it doesn’t get swallowed up on Monday nights. I’d love to follow the AMC shows but for some reason it won’t take my subscription no matter what I do. So I hope others notice the day change.